Learn fundamental nursing principles, concepts, and skills with ease! 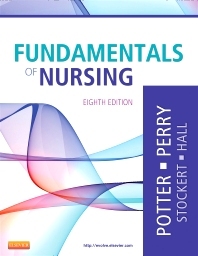 Fundamentals of Nursing, 8th Edition includes accurate, cutting-edge content, active learning strategies, and the latest evidence-based research to help you excel in your classes and prepare for success in today's competitive nursing field. An expert author team led by Patricia Potter and Anne Griffin Perry provides a trusted, comprehensive resource, thoroughly reviewed by nursing experts and peers to ensure the most accurate content. With practical, fully integrated study support, this edition makes it easier than ever to build the understanding and clinical reasoning essential to providing excellent patient care. UNIQUE! Clear, streamlined writing style makes complex material more approachable. UNIQUE! Critical Thinking Models in each clinical chapter show you how to apply the nursing process for successful clinical outcomes. The 5-step nursing process provides a consistent framework for clinical practice. More than 55 skills demonstrations guide you through each step for administering safe nursing care. More than 20 Procedural Guidelines clearly outline basic skill instructions. Unexpected Outcomes and Related Interventions for each skill alert you to potential problems and appropriate actions. Planning sections on Goals and Outcomes, Setting Priorities, and Teamwork and Collaboration help you plan and prioritize care. Implementation sections detail care guidelines for health promotion, acute care, and continuing care across all practice settings. Delegation coverage clarifies which skills can or cannot be delegated. Safe Patient Handling Guidelines help you ensure compliance with patient safety regulations. More than 25 Care Plans help you understand how to apply the 5-step nursing process to address individual patient problems. Patient Teaching boxes help you develop and implement successful strategies for patient education. Nursing Assessment Questions boxes help you phrase questions for more effective patient communication. Cultural Aspect of Care boxes provide practical guidelines for managing patients' cultural needs and preferences. Focus on Older Adult boxes highlight key aspects of nursing assessment and care for this growing population. Key Points summarize important content for more efficient study. Key terms at the beginning of each chapter include convenient page references to complete definitions. More than 25 Concept Maps illustrate care planning for clients with multiple nursing diagnoses. NOC outcomes, NIC interventions, and the latest NANDA diagnoses incorporated into Care Plans reflect national care standards you'll encounter in practice. UNIQUE! Caring for the Cancer Survivor chapter prepares you for the special challenges involved in caring for cancer survivors who still face physical and emotional effects of the illness and its treatment. Engaging study tools on the Evolve companion website reinforce your understanding with convenient access to skills video clips, skills checklists, chapter audio summaries, answers to practice questions, a calculations tutorial, a searchable audio glossary, a Spanish/English glossary, and more.